Positioning the car perfectly is more important than trying to attain the highest potential speed. For example, you will drop more time by correctly positioning the car nearer to slalom cones than you will by adding 1 or 2 mph in speed. Also, position is a prerequisite for speed. If you are not in the correct place, you will not be able to go faster. To go faster, the arc you are running must be bigger. A bigger arc requires less steering. To make a bigger arc that is centered in the same place, the arc must start sooner (turn earlier). Waiting until the last possible second approaching a turn and then dropping anchor at precisely the correct place so that the desired entry speed is reached exactly as you come to the turn-in point is quite difficult to execute consistently. It’s better to start braking a little earlier to give some margin for error. And by braking less, you can either add or subtract braking effort as you close in on the turn-in point. This will make you consistent and smooth. Always brake in a straight line. When you need to reduce speed only a moderate amount, try an early lift of the throttle instead of a later push of the brake. This is less upsetting to the car, is easier to do and thus more consistent, allowing for more precise placement entering the maneuver (remember No. 1). If you are under the limit, a slight push of the right foot will get you more speed with no additional side effects. On the other hand, if you are too fast and the tires have begun slipping, you can only reduce throttle and wait until the tires turn enough of that excess energy into smoke and heat. Don’t use your tires as brakes! 6. Use the gas pedal to modulate car position in constant radius turns, not the steering wheel. In a steady-state turn, once you have established the correct steering input to maintain that arc, lifting the throttle slightly will let the car tuck in closer to the inside cones. Conversely, slightly increasing the throttle will push the car out a bit farther to avoid inside cones. It is much easier to make small corrections in position with slight variations in the tires’ slip angle (that’s what you are doing with the throttle) than with the steering wheel. 7. Unwind the wheel and then add power. 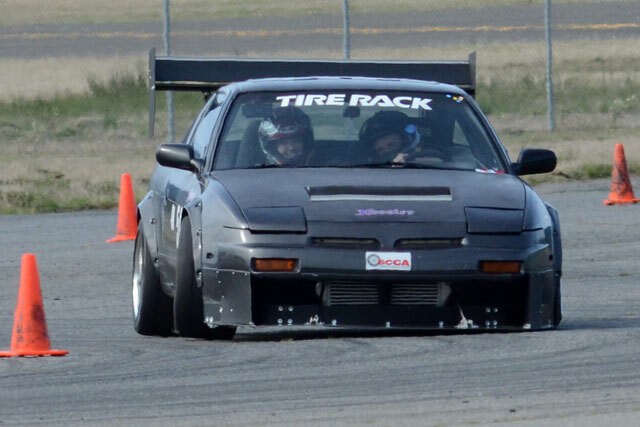 If the car is using all of the tire’s traction capacity to corner, there is none left for additional acceleration. At corner exit, as you unwind the wheel, you make some available. If you do not unwind the wheel, when you start to accelerate, the tire will start to slide and the car will push out (see No. 6). For slaloms, getting close to the cones is critical for quick times (see No. 1). To get close, we must move the car less, which means bigger arcs. Because the car doesn’t start changing direction until the wheels cross the center and because of the reaction times involved, your brain must make the decision to begin turning the steering wheel back the other way just before you go by the previous cone! Since this is a mental issue, a good visualization technique is to think about trying to run over the back side of each slalom cone with the inside rear tire of the car. To hit it with the rear tire (and not the front), the car must be arcing well before the cone and the arc must be shallow. Attack the back! 9. Hands follow the eyes, car follows the hands. 10. Scan ahead, don’t stare. Keep the eyes moving – looking ahead does not mean staring ahead. Your eyes must be constantly moving forward (and sometimes left and right). Glance forward, glance back. Your brain can only operate on the information you give it. Andy Hollis is a Solo National Champion and ProSolo class champion. His top ten tips are translated from the August 2005 issue of Sports Car. Use shoe polish or chalk in a few areas on the shoulders of your tires to see how far the tires are rolling over. If they are rolling over too far, add more air. If conditions are wet or cold, reduce the amount of air in your tires a little to try to gain grip. Try 5lbs less than you usually use. If understeering add pressure to the front tires. If oversteering reduce pressure in the back. If the car is understeering – loosen the front or tighten the rear. If the car is oversteering – tighten the front or loosen the rear. If the car is understeering – reduce front bar or increase rear bar. If the car is oversteering – increase front bar or reduce rear bar.